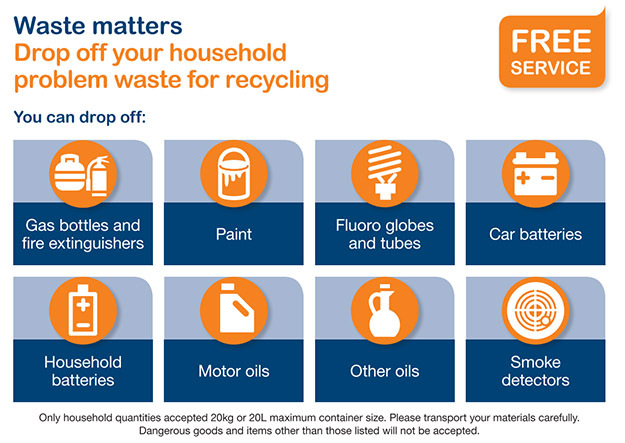 Did you know, Waverley residents can drop off household problem wastes at the Community Recycling Centre (CRC), managed by Randwick City Council? The CRC is a drop off centre for common household problem waste items that are not accepted in your kerbside bins. The CRC accepts common household problem waste items such as paint, batteries, polystyrene, gas bottles, e-waste and more, allowing for the safe disposal of these items. The CRC is located at 72 Perry Street, Matraville NSW 2036. When can I access the CRC? What can I take to the CRC? Please note: Only household quantities (20kg or 20L maximum container size) accepted.